Current limitations: 500 mA for +5V and +3.3V (to be shared between extension module and USB devices), 50 mA for -3.3V supply. 1 Red Pitaya Version 1.0 has -3.3V on pin 2. Red Pitaya Version 1.1 has -3.4V on pin 2. 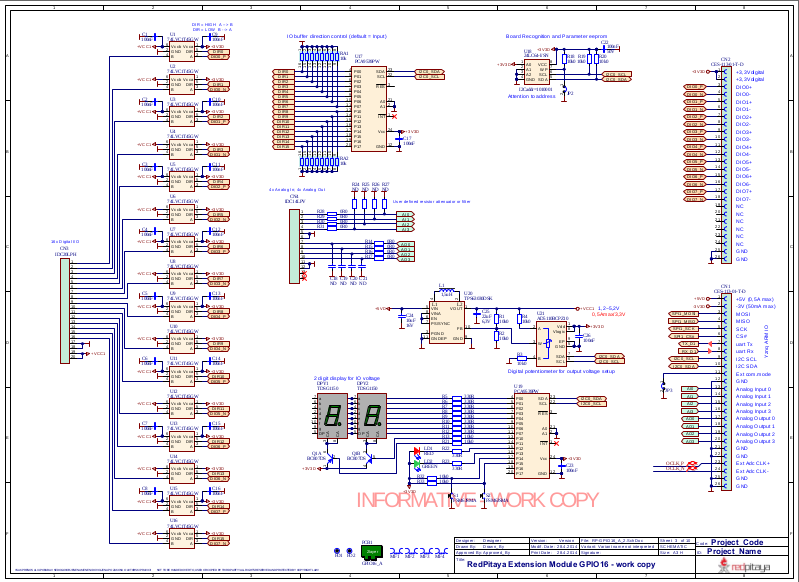 Schematics of extension connectors is shown in picture bellow. Input capacitance depends on jumper settings and may vary. A 50 Ω termination can be connected through an SMA tee in parallel to the input for measurements in a 50 Ω system. Crosstalk measured with high gain jumper setting on both channels. The SMA connectors not involved in the measurement are terminated. Measurement referred to high gain jumper setting, with limited environmental noise, inputs and outputs terminated, output signals disabled, PCB grounded through SMA ground. The specified noise floor measurement is calculated from the standard deviation of 16k contiguous samples at full rate. (Typically full bandwidth std(Vn) < 2 mV). Noise floor specification does not treat separately spurious spectral components and represents time domain noise average referred to a 1 Hz bandwidth. In presence of spurious components the actual noise floor would result lower. Measurement referred at high gain jumper setting, inputs matched and outputs terminated, outputs signal disabled, PCB grounded through SMA ground. Measurement referred to high gain jumper setting, inputs and outputs terminated, outputs signal disabled, PCB grounded through SMA ground. Further corrections can be applied through more precise gain and DC offset calibration. Default software enables sampling at CPU dependent speed. The acquisition of sequence at 100 ksps rate requires the implementation of additional FPGA processing. First order low pass filter implementation. Additional filtering can be externally applied according to application requirements. The output channels are designed to drive 50 Ω loads. Terminate outputs when channels are not used. Connect parallel 50 Ω load (SMA tee junction) in high impedance load applications. Typical power level with 1 MHz sine is 9.5 dBm. Output power is subject to slew rate limitations. To avoid speed limitations on digital General Purpose Input / Output pins are directly connected to FPGA. 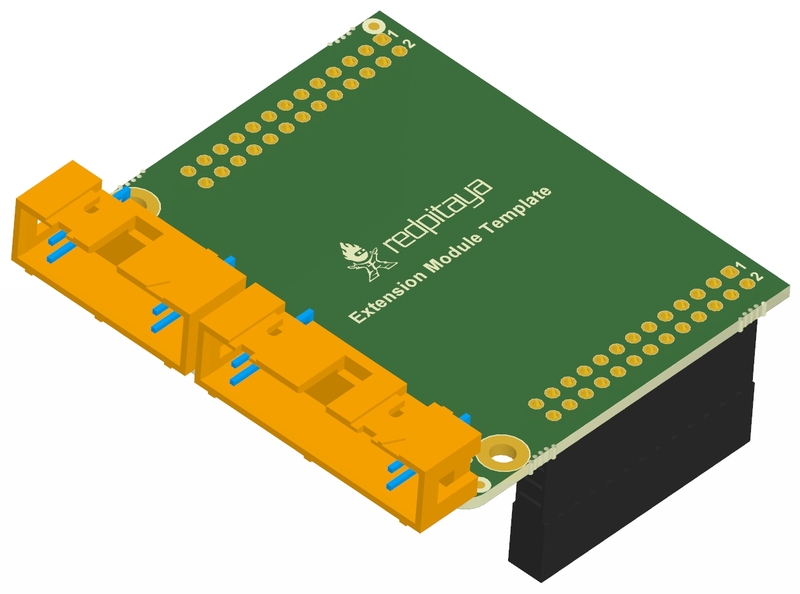 FPGA decoupling and pin protection is to be addressed within extension module designs. User is responsible for pin handling. The use of not approved power supply may deteriorate performance or damage the product. Heatsink must be installed and board must be operated on a flat surface without airflow obstructions. Operation at higher ambient temperatures, lower pressure conditions or within enclosures to be addressed by means of adequate ventilation. The operation of the product is automatically disabled at increased temperatures. Some parts may become hot during and after operation. Do not touch them. Measurement performance is specified within this range. Valid for low frequency signals. For input signals that contain frequency components beyond 1 kHz, the full scale value defines the maximum admissible input voltage. Jumper settings are limited to the positions described in the user manual. Any other configuration or use of different jumper type may damage the product. SMA connectors on the cables connected to Red Pitaya must correspond to the standard MILC39012. It’s Important that central pin is of suitable length, otherwise the SMA connector installed in Red Pitaya will mechanically damage the SMA connector. Central pin of the SMA connector on Red Pitaya will loose contact to the board and the board will not be possible to repair due to the mechanical damage (separation of the pad from the board). Jumpers are not symmetrical, they have latches. Always install jumpers with the latch on its outer side in order to avoid problems with hard to remove jumpers. Information furnished by Red Pitaya d.d. is believed to be accurate and reliable. However, no responsibility is assumed for its use. Contents may be subject to change without any notice. 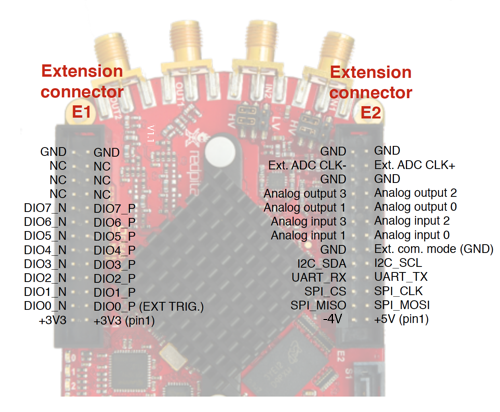 Red Pitaya can be also powered through pin1 of the extension connector E2, but in such case external protection must be provided by the user in order to protect the board! Protection circuit between +5V that is provided over micro USB power connector and +5VD that is connected to pin1 of the extension connector E2. 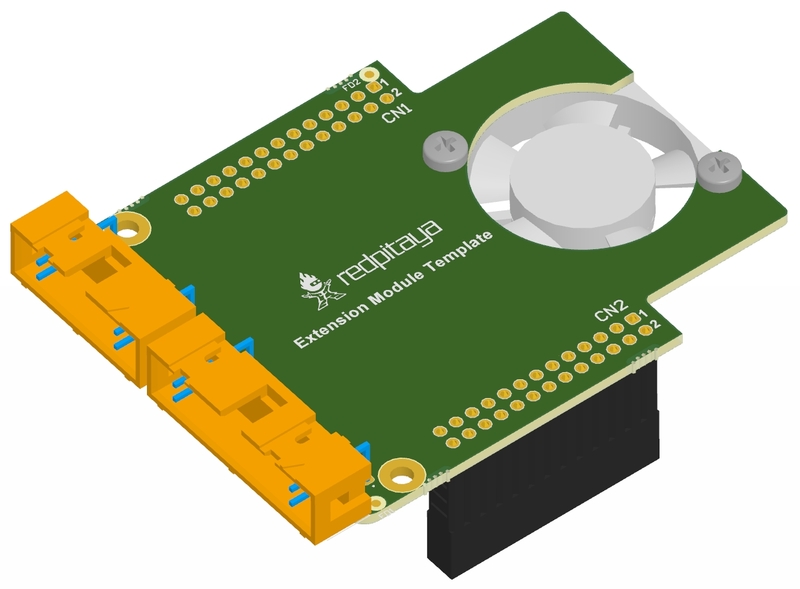 Figure: Proposal for hardware extension module template. Figure: Connectivity option – 20 pins. Figure: Possible implementation of some functionality (preliminary version). Figure: Option - forced air flow.